The name Pondicherry is more likely to conjure up in your mind images of pristine beaches and magnificent churches rather than temples, isn’t it? But this former French colony’s association with temples goes back a long way and some of these temples trace their origins to the 10th century AD. This small town with an interesting blend of French and Indian heritages is sprinkled with magnificent temples that are known as much for their religious significance as for their architectural beauty. Amidst the colonial era vibe and bohemian chic, these shrines paint a very different picture of Pondicherry. Interested in exploring this aspect of the sunny land? Then here’s our handpicked list of the famous temples in Pondicherry that are worth a visit on any day. 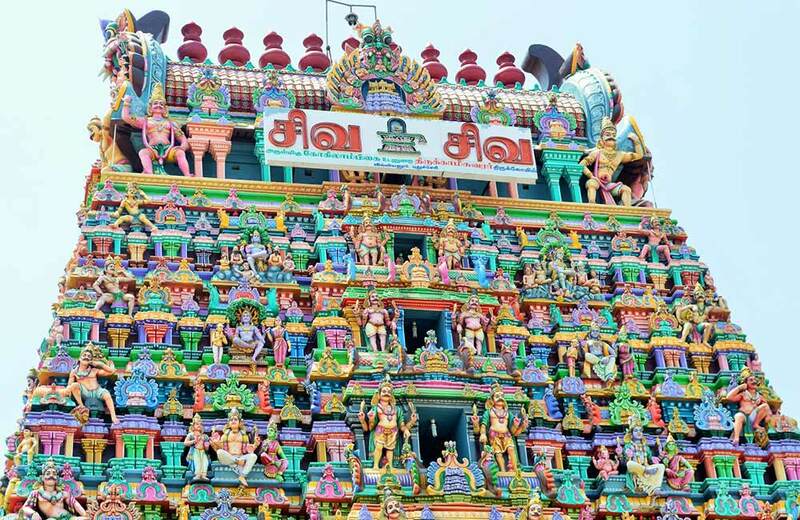 The brightly painted gopuram of this temple attracts instant attention of the visitors, but there’s more to Arulmigu Manakula Vinayagar Temple than its vibrant exterior and stunning architecture. Built more than 350 years ago, this ancient temple is dedicated to Lord Ganesha and draws devotees from all over Pondicherry and beyond. One of the unique aspects of this Ganesh temple in Pondicherry is that the deity here is seen in the company of his two consorts, Riddhi and Siddhi, which is a rare thing to witness. As per the Hindu scriptures, Lord Ganesha’s name is chosen from the 16 types of his forms. As such, the idol in this Pondicherry temple is named Bhuvaneshar Ganapathy. However, due to the location of the temple near the sea, it came to be known as Manal Kulathu Vinayagar. Manal means sand and Kulam means pond in Tamil. Later, it was named as Manakula Vinayagar. An imposing structure, the architecture of this Pondicherry Ganesh temple follows the Dravidian style, as is commonly seen in the temples of South India. Once you step inside this iconic place of worship, you will notice that the interiors are decorated with different forms of Ganesha. 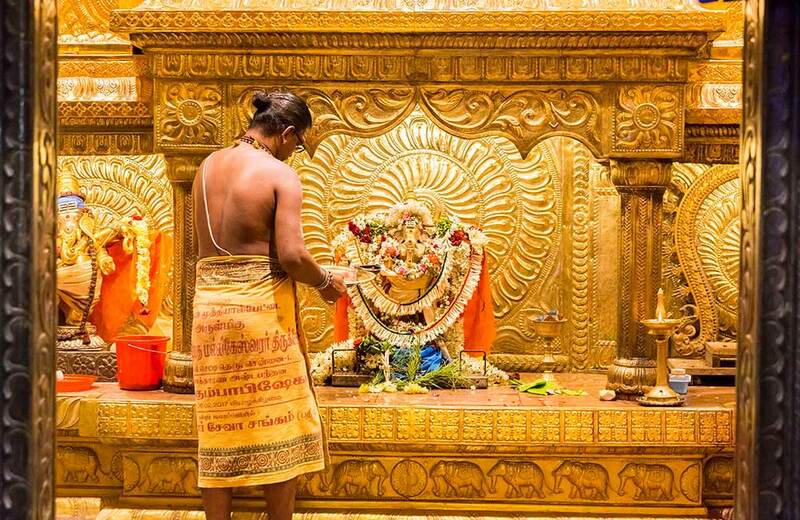 Among the main attractions of the temple is a beautifully engraved golden chariot made from teakwood and 7.5 kg gold. 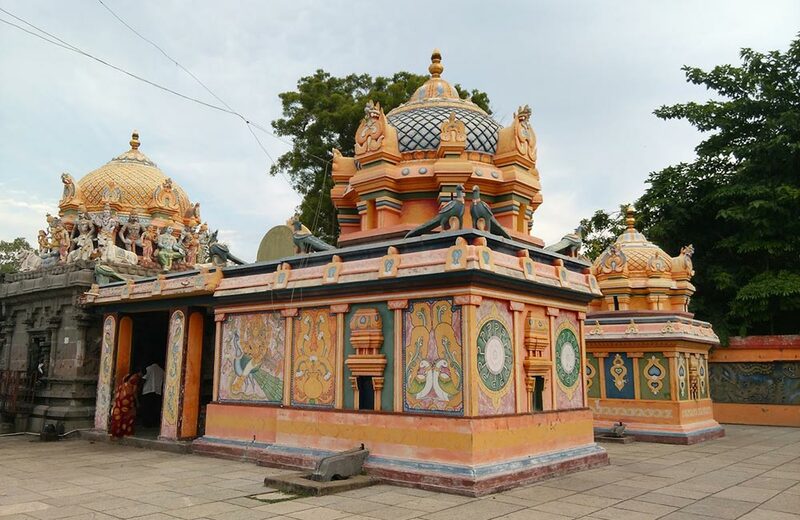 The temple complex also houses a shrine devoted to Lord Murugan, who is the younger brother of Lord Ganesha. Lord Shiva is a much-loved deity who is worshipped ardently in this temple town. The Vedapureeswarar Temple stands as an example to this. Considered to be the most famous one among the Shiva temples in Pondicherry, this place of worship was completely demolished in 1748 by the French troops. It was reconstructed in 1788 and since then, it has become one of the landmark places to visit in Pondicherry. Vedapureeswarar is worshipped in the form of a lingam in this temple. If you take a good look at the magnificent structure, you will realize that the architecture is similar to that found in many temples in South India – i.e. Dravidian style. 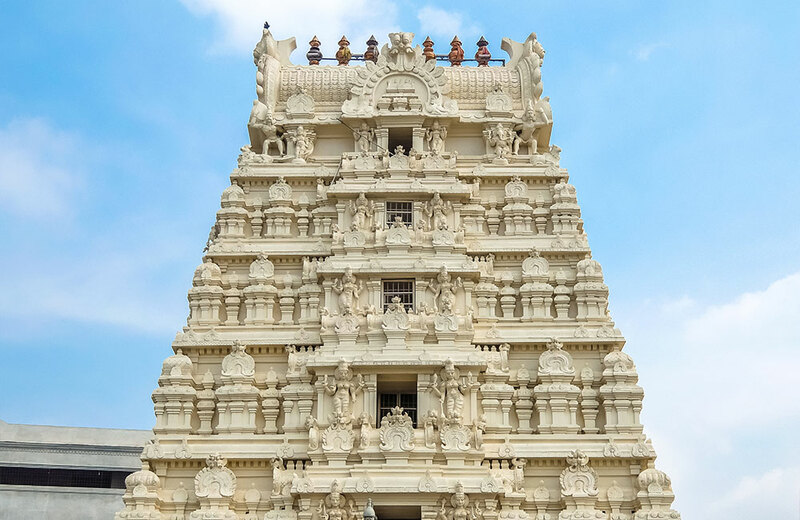 Keeping true to the defining aspects of this style, the temple structure includes a 75-feet-tall gateway tower or rajagopuram. The temple complex also houses a shrine dedicated to Parvati as Tiripurasundari. Enhancing the beauty of this place of worship is a rectangular water tank situated within its precincts. Located in the heritage town region of Pondicherry, Varadaraja Perumal Temple has been defining the religious fabric of the city for more than 800 years now. This landmark Vishnu temple was built by the Cholas in the 11th century and is among the oldest temples in and around Pondicherry. Here, Lord Vishnu is worshipped in the form of Varadaraja Perumal, and hence the name of the temple. The deity assumes a standing position and is accompanied by Sridevi and Bhudevi on either of his sides. 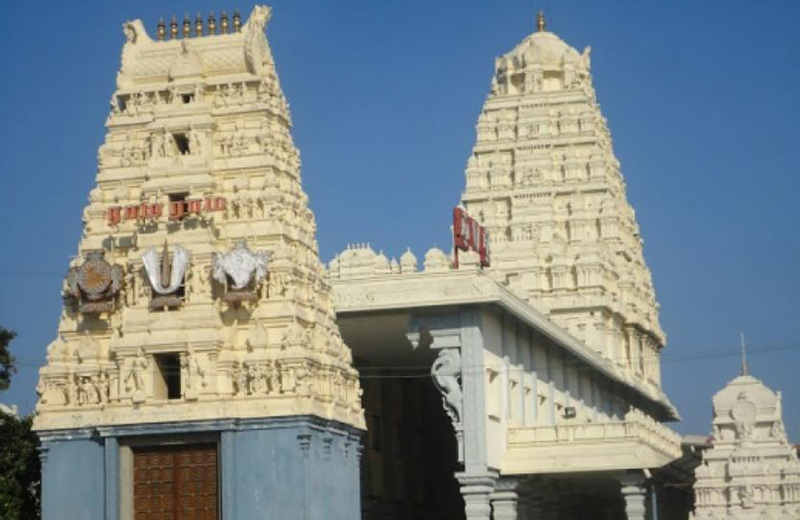 The temple boasts of a five-tiered rajagopuram (the gateway tower of the temple) that stands 110 feet tall. Built in the Dravidian style of architecture, it reflects the flawless creativity and craftsmanship of a bygone era. An interesting feature of this temple is the mirror hall that is situated adjacent to the sanctum. Apart from the religious and architectural significance, what draws visitors to this temple are the 83 springs that flow into the temple tanks. Devotees believe that the water in these tanks has medicinal properties and a dip in it can cure them of common ailments. Durga is worshipped by the Hindus in many forms. One such form is Kamakshi and the Kamakshi Amman Temple in Pondicherry is dedicated to this incarnation of the goddess. One of the most revered temples in the town, this ancient shrine is believed to be more than 500 years old. 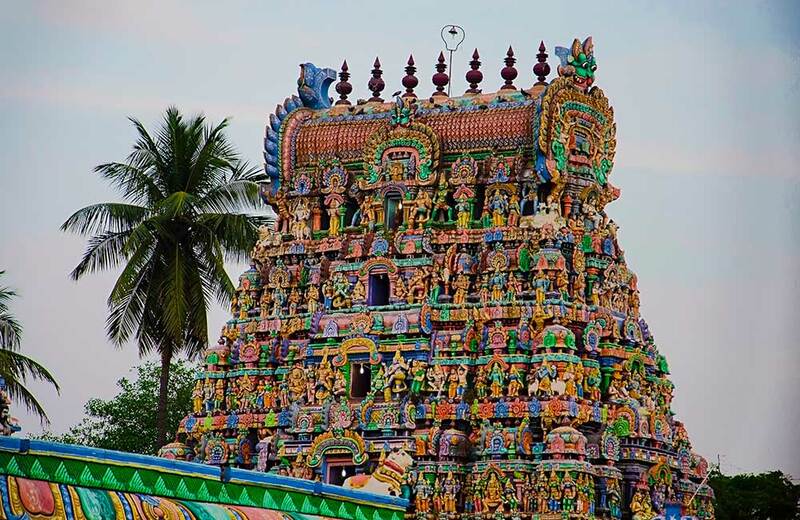 It is built in typical Tamil architectural style and has a large, decorated gopuram at its entrance. What sets this temple apart from the other shrines adorning Pondicherry’s landscape is that the main temple is devoid of the ornamentation that marks most of the other temples. But this has never stood in the way of the devotees who pay their obeisance to the goddess at this temple with much devotion. During festivals, the footfall significantly increases in this shrine as people flock there to seek the goddess’ blessings. Sri Gokilambal Thirukameswar Temple is also known as Villianur Temple. One of the famous temples around Pondicherry, this shrine is not just a religious destination but a major tourist attraction as well, thanks to its marvelous architecture. The presiding deity here is Lord Shiva, worshipped in the form of Thirukameswar (Shiva Linga). Gokilambal refers to the goddess worshipped with Shiva in this temple. It is an ancient temple that dates back to the 12th century when this place was under the rule of the Chola dynasty. If legends are to be believed, a Chola king once suffered from leprosy. He worshipped Lord Shiva and got cured of his ailment. As a mark of his gratitude for the Lord, he built this temple. 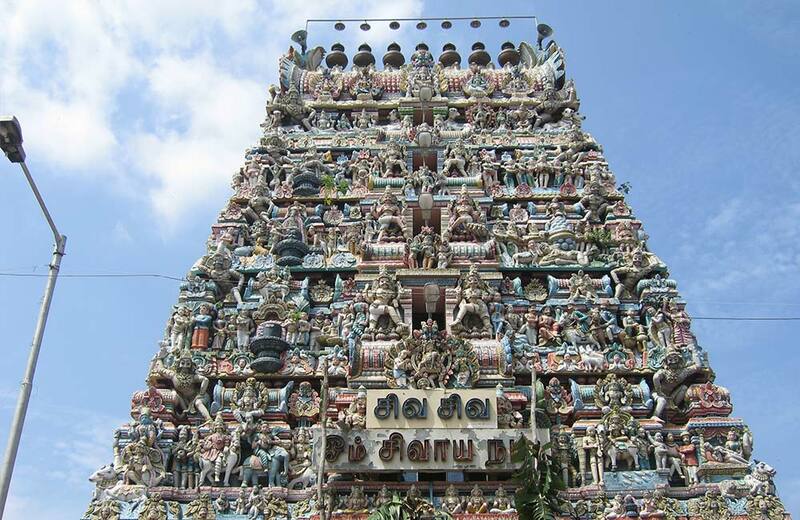 A large and beautifully constructed gopuram leads visitors to the inside of the temple. Adorned with carved images and ornamented pillars, the interiors open up a unique world of serenity and beauty for those visiting the place. One of the most popular events of this temple is the annual Temple Car Festival. During this festival, people pull the 50-feet-tall chariot containing the deity through the streets of the town. It is believed that whoever pulls the chariot will get their wishes fulfilled by Lord Shiva, attracting thousands of devotees from all parts of Pondicherry and Tamil Nadu to this place at that time. If you are interested to know more about the famous religious destinations of the town, you can read our blog on the famous churches in Pondicherry. A prominent name in the Pondicherry temple list, Sithananda Swamy Temple isn’t one of your regular shrines dedicated to the worship of celestial beings. 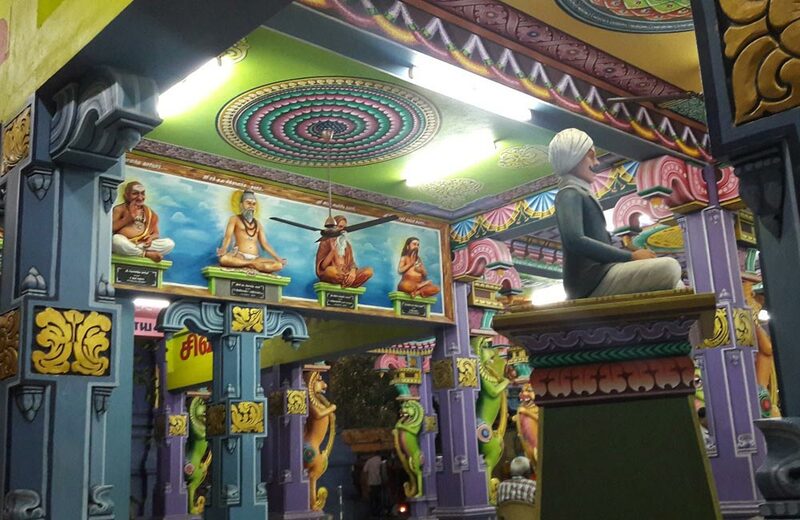 Rather, it is built to honor the memory and teachings of a saint, Guru Sithananda Swamigal. In fact, it is the Jeevan Samadhi of the saint and dates back to the 19th century. A Shiva Linga has been erected at the very spot where the Samadhi of the saint exists. Though located in one of the busiest areas of Pondicherry, Sithananda Swamy Temple exudes a certain serenity that is hard to describe. Once you step inside the premises, it feels as if you are transported to a different place altogether. The colorful main hall comes across as a lovely sight that refreshes your sore eyes. Beautifully crafted sculptures adorn the pillars of the hall even as the ceiling boasts of intricate paintings. The sprawling 44670 sq. ft. area of the temple includes trees, shrubs, and a pond. A unique feature of the temple is its bell which was made in France with an engraved image of the saint. Away from the beaches near Pondicherry, this is one place where you can discover tranquility in the midst of an urban hub. Hailed as one of the Devara Paadal Petra Shiva Sthalas, this ancient Shiva temple commands much respect from the devotees. It is counted among those few temples near Pondicherry where Lord Shiva is worshipped in the form of Mahakaleshwar. Believed to be built in the 7th century by King Kulothungan III, one of the rulers from the Chola dynasty, this shrine exhibits features reflecting the Ekadala style of architecture. A peculiar aspect of this shrine is that here, you can see broken pieces of Shiva Linga woven together by copper threads. Located in picturesque surroundings, the temple complex includes a large water tank. Coconut trees and banyan trees line the pathway leading to the temple and add to the tranquil ambiance. Not far from Irumbai Shiva Temple stands another shrine that is equally famous, if not more – the Panchavati Anjaneya Temple. As the name indicates, it is a Hanuman temple in Pondicherry and houses a 32 feet tall idol of the presiding deity. Along with this gigantic idol, the splendid temple architecture draws a large number of tourists and followers to this place on a regular basis. The shrine sees a huge footfall of devotees on Saturdays, which is considered to be the ideal day to worship Lord Hanuman. Sprawling across 12 acres of area, Panchavati Temple, Pondicherry is where you can spend some tranquil moments appreciating the vibe and beauty of the place. Among all the temples in Pondicherry, Navagraha Temple is truly a unique one as it is dedicated to the worship of the nine planets as per the Hindu mythology. Gigantic statues of the gods associated each planet can also be seen here. The largest among them is that of Saneeswara, the god associated with planet Saturn. While the statues of all other gods are of 15 feet, that of Saneeswara is about 27 feet tall. He is considered to be the main deity of this shrine. The temple holds a special attraction for those who are suffering from hostile planetary effects. It is believed that if you worship the deity of the planet that is adversely affecting you, the problems are resolved. Besides devotees, tourists also throng this place to appreciate the huge statues and the overall beauty of the temple. 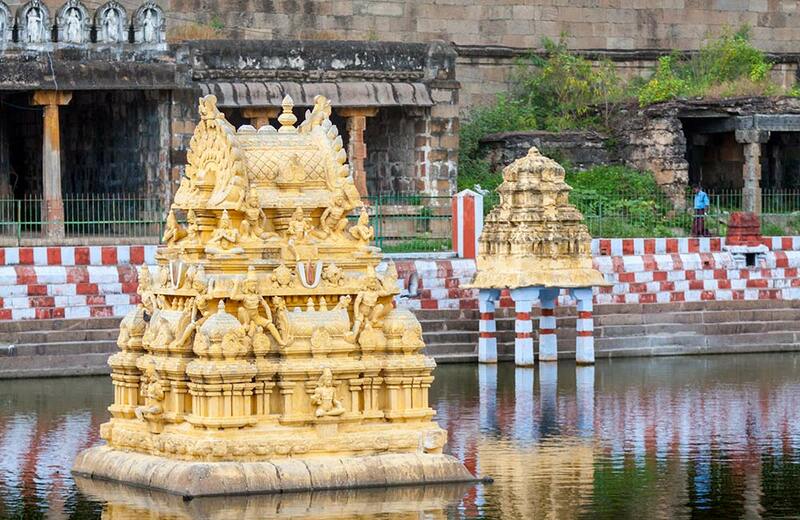 Just like the museums in Pondicherry, the temples of this town are also treasure troves of history. Each unfolds a saga of architectural craftsmanship as well as spirituality. Once you are done enjoying your time at the beaches, you must take out some time to explore these wonderful shrines in and around Pondicherry. There are a number of hotels in Pondicherry located close to these temples. So book your room and get ready to experience India’s deep spiritual roots right in the middle of French colonial legacy.